Octavo: a book or pamphlet made up of one or more full sheets of paper on which 16 pages of text were printed, which were then folded three times to produce eight leaves. 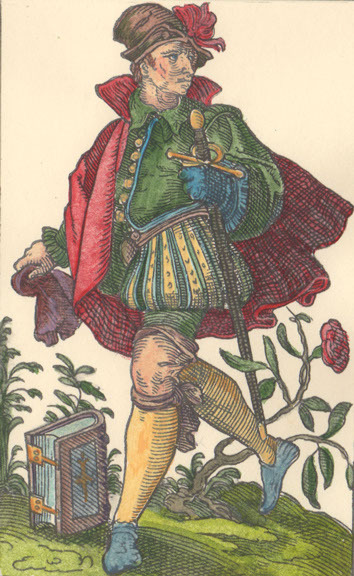 Each leaf of an octavo book thus represents one eighth the size of the original sheet. a progressive leader, very much interested in the arts and ideas of the enlightenment, but deeply opposed to the French Assembly. 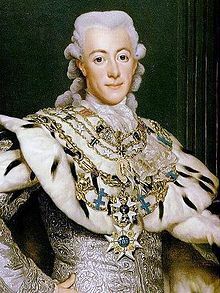 He had enemies including his brother, Duke Karl. But the protagonist here is not Gustav but, in the first person, one Emil Larsson, a card-shark in the rooms of Mrs. Sparrow by night and an enterprising Customs Sekretaire by day (and night). But in order to keep his government position he is told he has to marry. 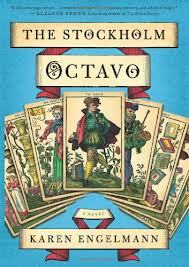 He meets a beautiful woman named Carlotta and almost at the same time, is summoned by Mrs. Sparrow for a special reading of the Octavo – a special deck of fortune cards. There are to be 8 readings (octavo) , one each night for a week. Mrs. Sparrow has exceptional “seer” skills and one of her clients is King Gustav. There are lots of characters in this book – when I’d be reading along and a name was mentioned, I had to really think to remember who that was. I didn’t need a character list but that was close. Another aspect of the book is the art and magic of fans – women’s fans – which can be used to communicate, acquire love, and kill – And there is the magic potent aspect – these can be used for good or evil, for sleep or death. Some folks have visions which need to be interpreted. Spies abound. It’s a complex tale. The point of Larsson’s Octavo readings is to identify those people who assume certain positions in his life and will, if nudged, provide him with love and connections. It implies to Larsson that Carlotta is to be a special connection, a romance. But this reading doesn’t necessarily hold up on subsequent readings when other people enter the picture. The next night the Carlotta and her benefactor The Uzanne come to Mrs. Sparrow’s card room for some gaming. The Uzanne is a rich and powerful widow who supports Duke Karl, Gustav’s brother and opposition. The Uzanne, like many other women, loves fans – her special one is named Cassiopeia, for the constellation. The Cassiopeia is won away from her. She is not happy. The politics and espionage are set. Mrs. Sparrow is a supporter of Gustav which puts Larsson on that side, but Carlotta, Larsson’s beloved, is tied to The Uzanne who supports the Duke. A few more characters are introduced, and a lot more plot twists unwind as Larsson tries to succeed in his quest to determine the characters of his Octavo and get married, while Mrs. Sparrow tries to nudge her characters into acting and save the life of the King of France. When the Divine Geometry gets involved in the plot there are certain resemblances to The Da Vinci Code. I think it gets a bit silly but it’s good-hearted fun. So, specifically, I don’t know all that much about Sweden’s history – it gets kind of lost. I kind of liked the idea of “nudging your fate. ” (those are my words). It seemed to imply a choice whether or not to pursue your destiny. And I have a feeling that I have a destiny which I can alter – if I don’t alter the darn thing it is my destiny – if I alter it I get a new destiny – destiny is just the projection of what is into its logical conclusion. – A nudge is possible.